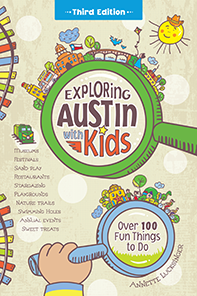 If it hadn’t been for research for Exploring Austin with Kids, seeing bats by boat would still be on my bucket list. Instead, it turned out to be one of my favorite things to do in Austin. In fact, now when we have visitors from out of town, it’s one of the most memorable events we book. •	You learn just as much about your city as you do about bats. The tours are guided. 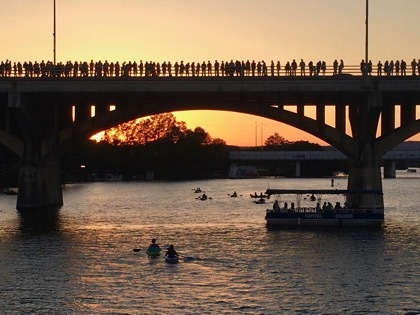 So as you troll around Lady Bird Lake waiting for the bats to emerge, you’ll learn facts about your city that you never knew. Ever wonder why you can’t swim in the lake? Can bats swim? What’s up with the building shaped like a flash drive? •	It’s relaxing being on the water for an hour and a half at sunset, yes, even with little children. There’s a lot to distract them and keep them busy - from boats, bridges, buildings, jokes, turtles, and bats. •	You can bring snacks and drinks! And not just the kid kind. So pack a small ice chest to bring on board. •	Though not as cheap, the view is better than from the bridge and you don’t have to worry about crowds or cars. •	Admittedly, it is a pretty incredible experience to watch a million bats stream from under a bridge in the middle of a city, squeaking and flapping overhead as they head east like billows of smoke. •	Go online and make a reservation at Lone Star Riverboat or Capital Cruises. •	Park in the Hilton parking lot just above the Lady Bird Lake Hike and Bike Trail where you’ll find the boats docked. •	Arrive early enough that your group can get seats together. Take a last restroom break before boarding! •	Don’t forget the snacks and drinks! •	Make it an adventure. Pack sunglasses, binoculars, disposable cameras, or notebooks for drawing while you wait for the tour to begin.